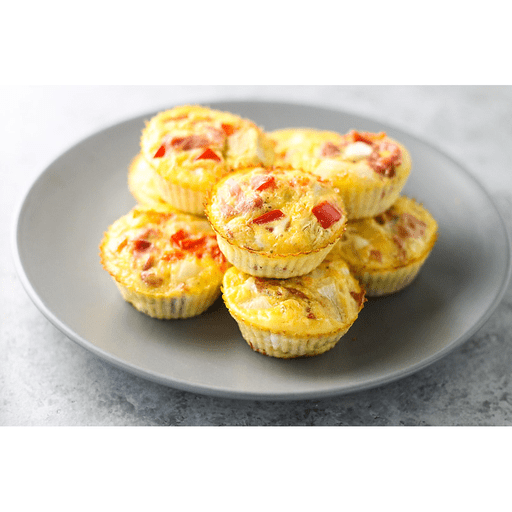 Packed with flavor, portable and individually sized, these egg muffins are an easy option for anyone in need of a quick meal. 1. Preheat oven to 350°F. Grease muffin tin with olive oil. 1. In a large bowl, mix together remaining ingredients and stir until well combined. Pour into muffin tin and bake for 10–12 minutes, until egg muffins have cooked and set. Pop out and serve. Try these egg muffins with mushroom and turkey sausage, Canadian bacon and spinach, or broccoli and cheese! Calories 200, Total Fat 13g (Saturated 4g, Trans 0g), Cholesterol 300mg, Sodium 350mg, Total Carbohydrate 5g (Dietary Fiber 1g, Sugars 3g), Protein 15g, Vitamin A 25%, Vitamin C 60%, Calcium 4%, Iron 10% *Nutritional values are an approximation. Actual nutritional values may vary due to preparation techniques, variations related to suppliers, regional and seasonal differences, or rounding.